1. In a mixing bowl add maida, rice flour and baking powder. Add water for the thinning of batter and keep it aside for 10 minutes to set. The consistency of the batter should be exactly as shown in photo below. 2. Meanwhile, for filling, take another mixing bowl. Add milk maid, grated coconut, resins and cashew nuts. Mix it well. Add elaichi powder for more intense flavor, if you like. 3. Spill 1 tbsp oil on pan. When oil is heated, take 1 tbsp of batter and spread it in a round shape. When it starts turning light golden, take it off. Repeat the same process until you finish the batter. 4. Next step is, filling. Spread patishapta filling on one side and roll it. #1: You may use Khoya instead of milkmaid. Patishapta, is Indian pancakes. It is a must taste for those who have a sweet tooth. Simran Kaur is from Gorakhpur, Uttar Pradesh. Besides her studies and composing poetry she has a great interest in cooking and experimenting with that. Her Dad is the one who evoked her about the beauty and greatness in cooking. He keeps on guiding her and encouraging her in the kitchen. She says, "Cooking is something more than cooking. It strengthens the bond and increases the love for each other. Above all, It's expressive! 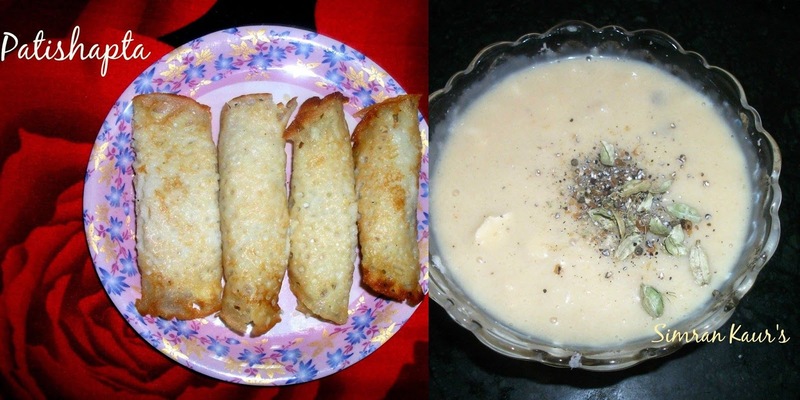 I am very happy to share my recipe here with you all. Thank you so much Vidhya di for giving me such a great privilege to be here and express myself the best way I can. Hope you all like the recipe." Do try it out and you are welcome to post the pics here. Thank you for visiting Vinayaka’s Kitchen. You can like our kitchen on Facebook, subscribe to our video guides on YouTube and website feeds on Feedburner, follow our kitchen on Google+, download our android app or connect with me on Google+ to get notifications of our latest recipes.